Beloved daughter of Jennifer M. Vega and Martin A. Rivera. Cherished stepdaughter of Manuel Vega. Loving sister of Jazlyn, Samantha, Jessica, Emma, and the late baby Martin. To ALL my family and friends, because of you, I had 23 years of love and care. Life is unpredictable so love each other and look for my smile in the sunshine. 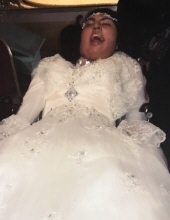 Funeral Wednesday 9:00 a.m. from the Robert J. Sheehy & Sons Funeral Home, 9000 W. 151st Street, Orland Park, IL to Our Lady of the Woods Church, Mass 10:00 a.m.
"Email Address" would like to share the life celebration of Inez Yolanda Rivera. Click on the "link" to go to share a favorite memory or leave a condolence message for the family.